Everyone is looking for free mobile recharge sites. And why not , when so many new start ups are offering such a good deals to earn free mobile recharge. There are many free mobile recharge earning sites have grown in last 2 years in India. And as a tech geek , i keep on looking for new free recharge offers and you might too. So i thought of listing top free mobile recharge earning websites here. Best Offer : Order Free Rs 2500 Grocery from Peppertap Trick. 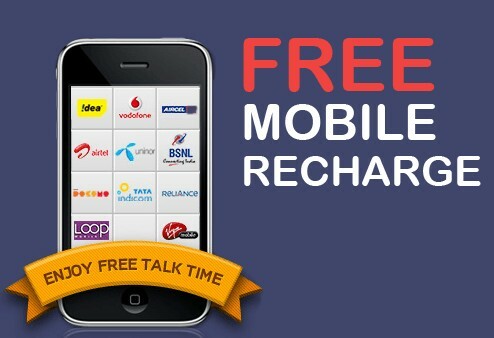 Daily some free mobile recharge app or website comes with some referral offer. You just have to refer your friends and when they download these apps you will get earn free recharge. We have lots of friends like us , who also want to earn free recharges. So when you refer them , your friends also get some money. So its a win win deal and everyone wants to have such offers. Also Check : Free Food and Auto App Jugnoo, Free Recharge Tricks and Offers. Grab upto Rs 100 discount using Paytm discount coupons for mobile recharge. Free calling tricks for Idea, Aircel, Voda and all networks. As there are many free recharge earning sites, but we always looks for best, so here i am listing only working sites to earn free mobile recharge and i am sorting them according to the payout, so you will earn maximum recharge. 1. Mcent : Mcent is the oldest and the best free recharge earning app. I have earned thousands of free recharges using Mcent. They keep on increasing and decreasing referral fee, once they have increased it to about Rs 700. That’s a very big amount per referral. Beside referral amount they pay you when you download and try some app. You can earn unlimited free mobile recharge using Mcent , just by downloading and referring your friends. You will only earn money when you atleast try single app. Download MCENT Now. Also Check Mcent Unlimited Trick. 2. Ladoo : Ladoo is also same like Mcent, they also pay good amount per referral and you can earn more money by trying some apps. There are lots of app download offer, you just have to download any try them for some days and then they will add money to your wallet. then you can use it to recharge your mobile for free. Download Ladooo Now. 3. Flipkart : The top eCommerce company in India has recently launched the refer and earn program, they are paying Rs 50 per referral or per app download. So you just have to refer your friends and when they download flipkart app, both you and your friend will earn money that will be credited to your Flipkart wallet. You can use it to buy anything from Flipkart. 4. Snapdeal : The another top eCommerce site in India offering Rs 50 per referral. Now i feel why to invest our money when we can refer and earn and then just use this money in shopping. When you refer your friend to Snapdeal and you friend download Snapdeal app you will get Rs 50 and your friend will also get the same. 5. Shopclues : So here is another shopping site offering free money for referral. Just download shopclues app, refer your friend and earn credits. Use credits to shop, it’s so cool , we just need to download apps and we can shop for free. 6. Uber : We have done lots of mobile recharge, shopping and now its time to make some ride. Now you can take free rides on Uber. Simply refer your friends , they will get free rides upto Rs 1000 for free and when they take ride you will also get free ride on Uber. I have earned lots of free rides , it feels good when traveling in luxury Ac cars with drivers. My Uber Promo Code : Viiin. 7. Taxi For Sure : Another app for cab booking. Now book a cab for free and take ride upto Rs 100 with Taxi for sure. Just refer your friends on whatsapp, facebook to download taxiforsure app and when they take ride , Rs 100 will be added to your TaxiforSure walllet. Noe you too can take rides with your earned money. 8. OLA : So you know that OLA is very famous Cab service in India with cabs in almost all cities in India. Simply refer and take free rides in OLA cabs. Ask your friends to download OLA cabs with your referral code and then enjoy free rides. You can use this OLA cab referral code for new user. 9. Goibibo : Now you get everything, now its time to travel some other cities. Refer your friend to download Goibibo app and when they download they will earn Rs 1000 Go cash and you will earn Rs400 Gocash. Now travel on Flights for free using your Go cash, stay in Hotels and many more. 10. Oyo Rooms : Book free Hotel rooms with Oyo rooms, just make your friend Download Oyo app with your Oyo referal code and they will earn free Rs 500 in their Oyo wallet and you will get Rs200. You can use these amount to book Hotel rooms for free. 11. Ulto : now get free recharge by sending SMS , yes just send free sms to friends and you will get free recharge. 12. Jugnoo : Now enjoy free auto rides and free meals from your favorite restaurant. When you refer your friend to Download Jugnoo app, you will get Rs 100 in Jugnoo wallet and your Friend will also get Rs 100. Now both of you can use this to get free auto rides and free meals. To earn free mobile recharge, yo u just need to complete some tasks. Like i have listed some mobile apps. You just have to download those apps with my referral links. In some apps i have also provided my referral code, make sure you use my referral link and code. As you will only get money when you use these referral codes or links. So its like , you will also earn and me too. But if you ignore these link that we both will get nothing. So download these apps with my referral , and then you will earn some free mobile recharge. Now use your referral code and invite your friends to download these apps and then you will get free mobile recharge when they will download apps. So this is my free mobile recharge tricks, that i am using to earn free mobile recharge. Now you can also earn. Not only mobile recharge, you can now do lots of things for free. Like you can shop, take rides, travel hotel and lots more. And everything is free.